Prologue. Where does the Butterfly go? 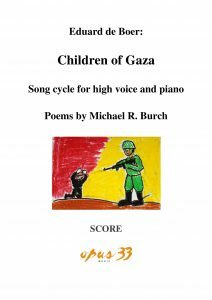 The full text of the poems can be read and / or downloaded here, together with introductory background information: Children of Gaza – Introduction and Text of the Poems. The full score may be copied, shared and distributed freely. It can be downloaded here for free: Children of Gaza – Partituur met Voorwerk. It will be appreciated if information about performances and / or recordings of this cycle or part thereof is sent to hallo[at]eduarddeboer.org.